In an interview decades ago, Duke Ellington likened the writing of good music to cooking a fine dish: both he said, and I paraphrase, must have the right ingredients, mixed and cooked to perfection to produce that dish redolent in beckoning aroma and great taste. What The Duke did not say, but might have suggested apropos of his own efforts was that the more ingredients you added the more resplendent the dish became and this was so true of his own music made by his iconic orchestra. Many musicians down the ages have learned that this is absolutely true, whether they got it from Ellington of Charles Mingus, Count Basie or others and while Taylor Cook’s current effort is neither a big band, nor a tiny ensemble, he has certainly got his dish right. The Cook Book as a title may have come easy, seeing as it was named after its lead hand, the alto saxophonist, flutist and clarinettist. But listening to the music it becomes evident that the same meticulousness that goes into cooking a great dish has gone into the creation of this musical cookbook. And with that the reeds and woodwinds player has proved that his writing is as significant as his virtuoso playing. All but two of the charts here are compositions by Taylor Cook. They are masterful in every way. Melodic and harmonic as if they have come from a vast tonal palette. There is an acute understanding of texture and timbre. This is evident on the marvellous aesthetic of ‘Splainin’ and ‘El Toro’. Cook also has a wonderful sense of time which is why every song is beautifully and rhythmically paced. Playing with musicians that you are comfortable around also might have something to do with the success of this album. Tim Ries is one of the main reasons for that. Ries is an exemplary leader – both in the classroom as well as on stage and in the studio. His involvement as producer and as soloist on ‘El Toro’ raises the bar on both production and performance. Lest we forget, however, this is Taylor Cook’s recording. His playing is memorable. Cook’s playing is imaginative and flows with wonderfully natural ebullience. When he solos, no matter what instrument it is on, he conjures magic in the delicate and balletic readings of his cores. 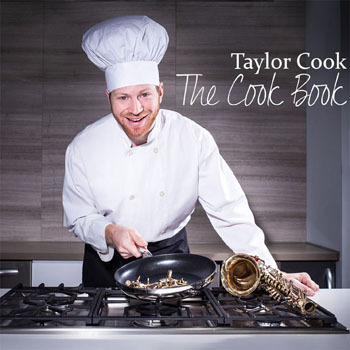 Taylor Cook is a true virtuoso and his playing has an airborne grace and definitive precision. All of this together with a recording of crisp transparency makes for a memorable disc. Track List: The Replacement; Splainin’; Backstroke Boogie; Biker’s Dozen; Bookin’ It! Here We Go Again; El Toro; Lilia; On the Sunny Side of the Street; Testifyn’. Personnel: Taylor Cook: alto saxophone, flute, clarinet; Jack Bodkin: piano, Fender Rhodes, Wurlitzer; Brandon Wall: guitar; Justin Gray: acoustic and electric bass; Robin Claxton: drums; Alex Samaras: voice (2); Tim Ries: soprano saxophone (7); Mike Murley: tenor saxophone (1); Jeff LaRochelle: tenor saxophone (2, 3, 9); Dave Neill: baritone saxophone (9); Emily Johnson: alto flute (5); James Rhodes: trumpet (4, 9); Andrew McAnsh: trumpet (9); Karl Silveira: trombone (4, 9); Anders Azzopardi: trombone (9); Aline Homzy: violin (4, 8); Ben Plotnick: violin (45, 8); Anna Atkinson: viola (4, 8); Amahl Arulanandam: cello (4, 8). taylor. congrats. I can now say I knew him when. drop me an email when your western trip is on. perhaps we can arrange a gig at the Dream. now I’m going to have to buy a copy.